We’ve already covered some of the well established retro styled television sets that have hit the market in recent years like the LG Serie 1 and the Seiki SE22FR01. Recently, Crosley has gotten in on the action with their own terrific looking 60’s/70s influenced sets. The great thing about these is that they don’t require a digital converter box or anything. They come with all the bells and whistles and utilize current tv technology, but offer the appearance of an old analog tv. Style wise, I really hate the way most newer tvs look. The downside of course is that all this stuff is made in china, which of course cancels out some of the “magic” in the salvaging of the classic aesthetic to some degree. Midcentury modern aficionados will dig this 24-inch, LED television that has an authentic vintage look but features all the 2014 electronic and sound quality. It has a wood trim exterior and like most newer tvs, can also be used as a computer monitor. 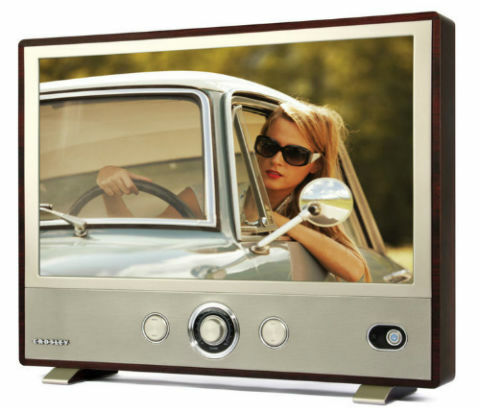 This Crosley TV doesn’t seem to be based on any specific vintage model. Rather it’s just made to look like it’s from that era. The set is available for around $230 at various places on the web. It came out in around 2014, but is still readily available online unlike the LG Serie 1, which seems nearly impossible to find at this point.